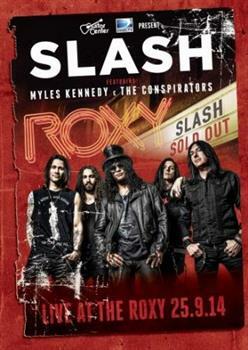 On September 25, 2014, shortly after the release of their "World On Fire" album, SLASH FEATURING MYLES KENNEDY & THE CONSPIRATORS took the stage at the legendary Roxy Theatre on Sunset Strip in West Hollywood. The atmospheric venue, steeped in rock history, gave fans a brilliant opportunity to experience the band up close as they delivered a set packed with more recent solo tracks, including several from the new album, and classics from Slash's earlier career with GUNS N' ROSES and VELVET REVOLVER. The intimate setting inspired the band to deliver a scintillating, dynamic performance, due for release on June 15 on 3LP set, as well as 2CD, DVD and Blu-ray. 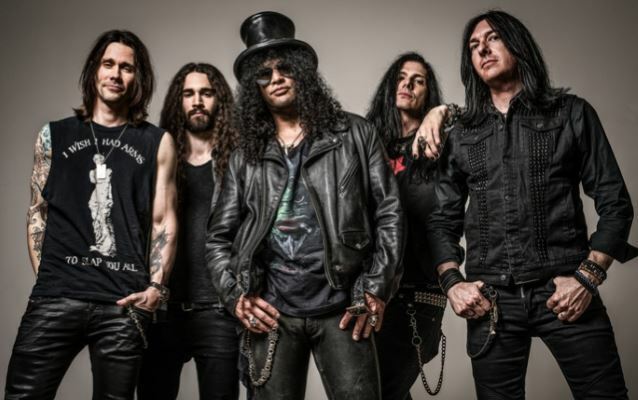 Speaking about his working relationship with his backing band THE CONSPIRATORS — Myles Kennedy (vocals), Brent Fitz (drums), Todd Kerns (bass) and Frank Sidoris (touring guitarist) — Slash told Australia's Moshcam: "It's just something that clicked right from the very beginning. Initially, Myles and I just had that spark, sort of a creative connection, from the very, very beginning. And that's something that's established; it always happens when we work together. And then, with Brent and Todd, it's the same kind of thing where we just have a really great writing and performing and recording chemistry, where everybody just really digs what we are about individually and collectively, and it just works." Asked if he thinks more in terms of being a solo artist or as a bandmember, Slash said: "I don't think I ever really thought in terms of solo artists, per se. Ever since I first started playing guitar, I've always been drawn to the band dynamic. But being in a position to steer it where I want it to go, and be more of a captain of the ship was how it first started. And at this point, now that we've been working together for a while, it definitely has turned very much into a band. But all if do is spearhead it." Slash recently told Classic Rock magazine that he has "already started working" on material for the follow-up to "World On Fire". "On the road is the platform that I find is the easiest for me to work on new material," he said. "It's easier here than it is for me to do when I'm at home. So I just get going. I take my phone and I record ideas on the phone and then we jam stuff at soundchecks; when we have soundchecks. So we compile a bunch of ideas, and then when the tour is over, we go home and, sort of, hash them out." "World On Fire" sold around 29,000 copies in the United States in its first week of release to land at position No. 10 on The Billboard 200 chart. The CD arrived in stores on September 16, 2014 via Slash's own label Dik Hayd International distributed through Roadrunner Records (Europe, Middle East, Africa and Latin America).